With its gleaming skyscrapers and bustling city streets, Singapore’s probably the last place that anyone would imagine growing fruits or vegetables in. Add in the swelteringly hot weather and limited spaces, and that seems even more challenging. But a handful of restaurants and hotels here have done just that, by cultivating their own gardens and farms on their premises. The fresh produce — which ranges from fruits to herbs and vegetables — is later harvested and used in dishes. 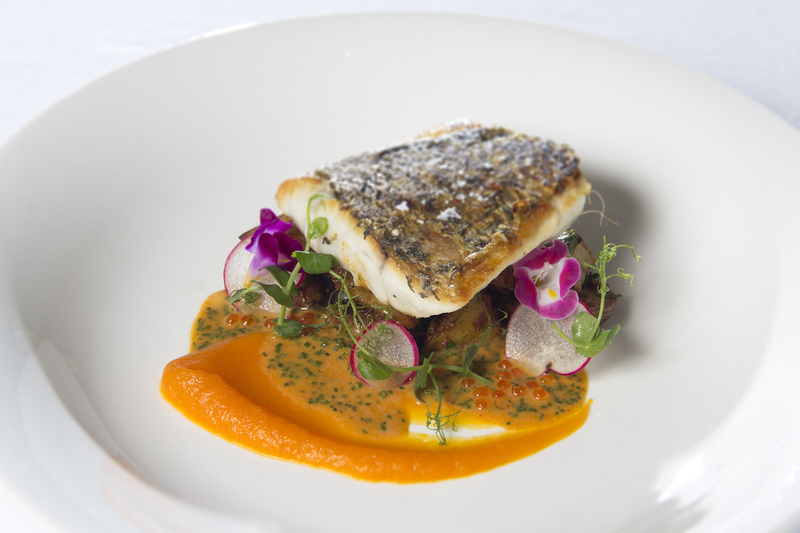 Portico Prime’s Barramundi is served atop a bed of homegrown greens such as dill and basil. Low’s second restaurant, which opened at Dempsey last year, has a plot of land set aside for growing vegetables and herbs such as okra, thai basil, onions, southwood dill and clown flowers. These are used either as garnishes or prime ingredients in dishes such as its pan-seared Barramundi and deconstructed black forest dessert. 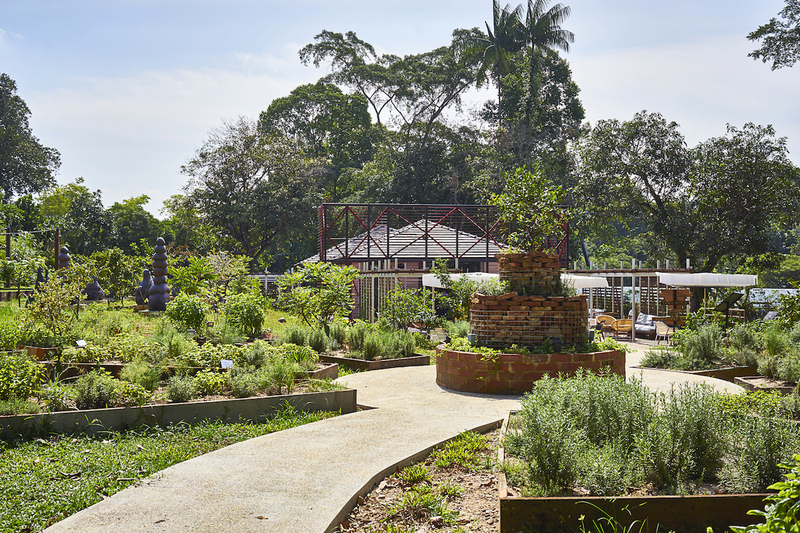 “The advantage of growing our own produce, is that we will always have a steady and consistent batch of herbs,” says Low, whose other Portico along Alexandra Road also has a herb garden. 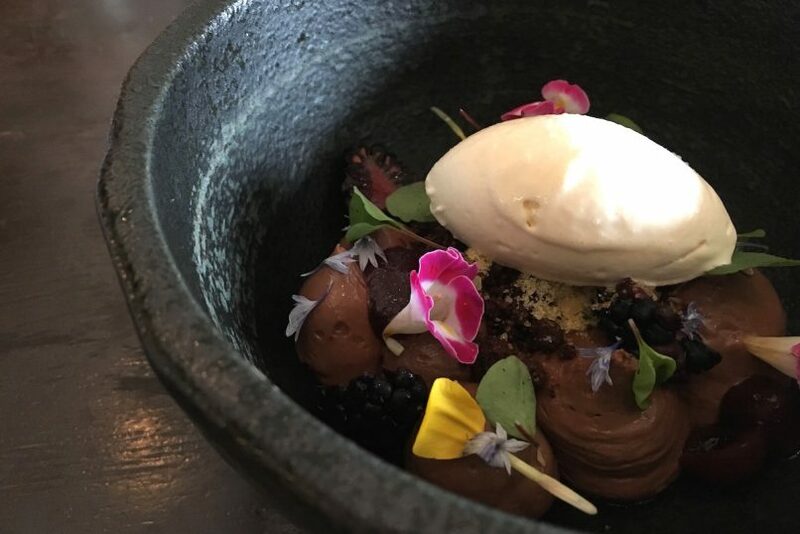 The restaurant’s deconstructed black forest dessert is beautifully presented with freshly plucked clown flowers. Over at Open Farm Community, acres of lush green foliage and majestic trees may well fool you into thinking you’re in the idyllic countryside. The restaurant grows more than 100 types of herbs, vegetables and fruits such as okra, eggplant, rosemary and passionfruit on its 29,000-sq-ft garden, and it’s a common sight to see straw hat-wearing farmers tending to the crops. Signature dishes at the restaurant include a coal-baked haddock omelette sprinkled with freshly plucked tarragon, and mushroom rigatoni topped with Thai basil (also from the garden). Open Farm Community grows an assortment of herbs, fruits and vegetables in its massive on-site garden. “Growing our own produce allows us to ensure the freshness and quality of the ingredients we use to prepare our dishes,” says Head Chef Daniele Sperindio. “It also allows us to be more creative in the menu creation, because we can work with new ingredients that grow well in our climate.” Edible flowers such as red hibiscus and butterfly blue pea are also grown and used as garnishing in the restaurant’s food. Other advocates of homegrown produce include Middle Eastern eatery Artichoke (which cultivates various herbs and peppers in its courtyard) and Modern European restaurant Violet Herbs, which grows some 20 different types of herbs in its rooftop garden. 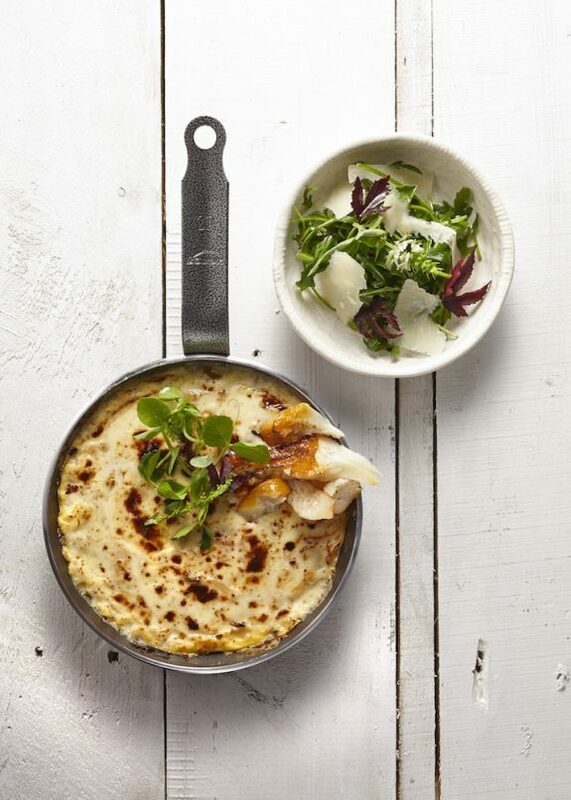 Open Farm Community’s coal-baked omelette dish is topped with tarragon from its garden. Even hotels such as Parkroyal on Pickering, Fairmont Singapore, Swissôtel the Stamford and One Farrer Hotel & Spa have jumped on the agricultural bandwagon. Last September, the latter launched an 11,000-sq-ft urban farm and orchard, where over 50 varieties of spices, fruits, herbs and vegetables are cultivated. The harvest, which ranges from sugar cane to bittergourd and papaya, is used in dishes at the hotel’s eateries and cooking studio Origins Of Food. 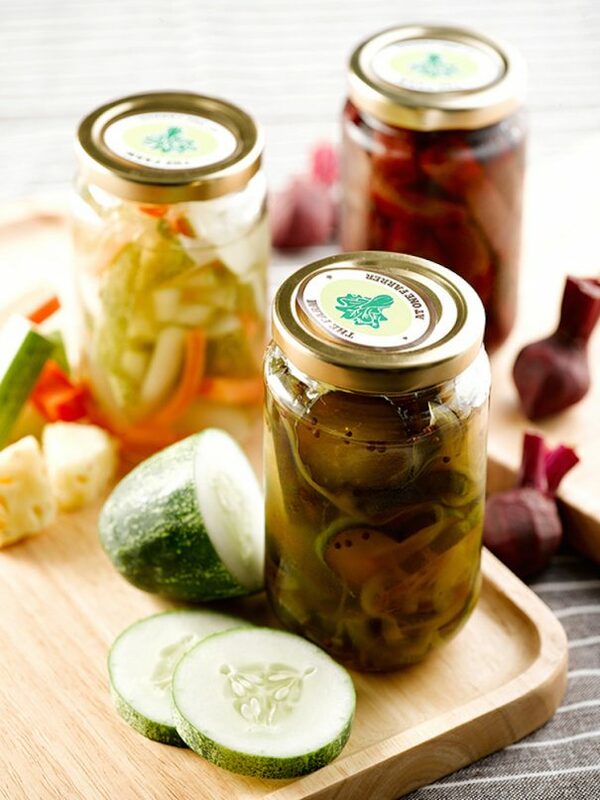 Some of the produce such as cucumber and pineapple are also pickled and packaged in jars for retail. The cucumbers grown at One Farrer Hotel & Spa’s urban farm are harvested, pickled and bottled for sale. Fairmont Singapore and Swissôtel the Stamford — which are located next to each other — are also dedicated to growing their own produce. Their revamped herb garden, which is slated to open in the last quarter of this year, will yield crops such as tomatoes, basil and herbs — to be incorporated in dishes at the hotels’ restaurants. Most of the herbs will be cultivated in planters and pots to deter pests, and there will be a greenhouse on-site to speed up the process of growing micro herbs and cresses. “Cultivating our own herb garden not only allows us to use the herbs in the food we serve, but also gives us the opportunity to practise organic farming,” says Robert Stirrup, Executive Chef of both hotels. The notion of growing food in one’s own backyard may sound romantic, but experts say it comes with its share of challenges. One obstacle is the time needed for the crops to grow. “Every element [of cultivating the produce] has to be planned,” says Low of Portico Prime. One Farrer Hotel & Spa opened its sprawling urban farm late last year. Maintaining a farm also takes much time, effort and manpower. 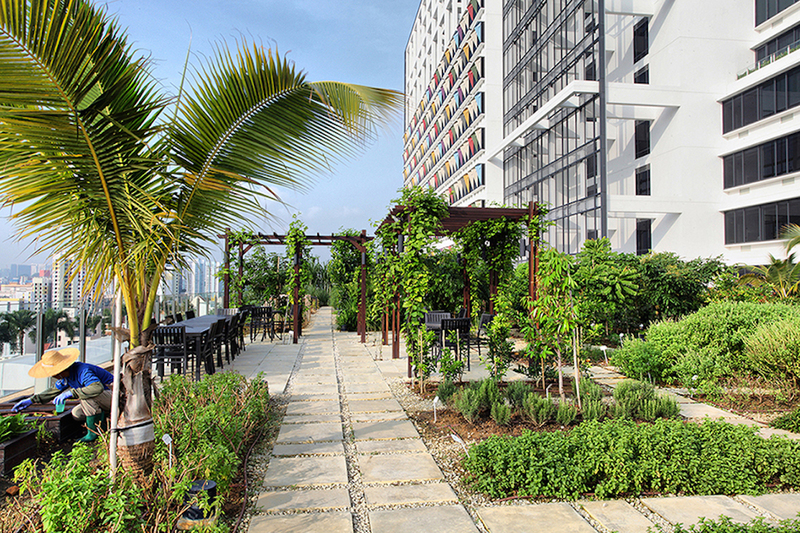 “In addition to watering and caring for the plants, we must also manage the frequent harvesting of the herbs, spices, vegetables and fruits; nurturing and replanting many of the varieties, as well as rotating the plants to renew the nutrients in the soil,” explains Dr Helfer of One Farrer Pte Ltd. His hotel employs four full-time farmers — all retirees from the Farrer Park neighbourhood — and a horticulturist to tend to the crops. That said, advocates of farm fresh produce find it all worthwhile when they reap the (literal) fruits of their labour. “Growing our own produce allows us to strengthen our appreciation for nature, and have a better understanding of the ingredients we use daily,” says Sperindio.